Note: This was supposed to have been done in August, but it was not done then. Let’s hope it is really fixed now. This item is now made into 3 slots. Please check it out. The drill rate for this item is increased by 4x. This item is now included in the list under Event – MyCamp Ticket Exchange on website. 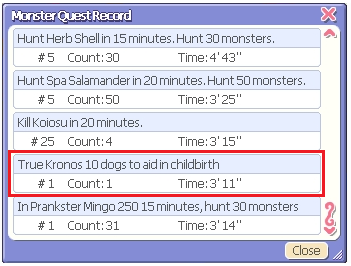 In order to help with more Tartarus testing, RedSonja’s completed quest, shown below, is deleted. Sea Elephant Card is now dropped by the monster, Sea Elephant. Item 2.1 is not done because, according to GM, it is not the name of the quest. Items 2.2 – 2.8 are done. Description: Bring 1x [JP]Concept Sketch 1, 1x [JP]Concept Sketch 2, 1x [JP]Concept Sketch 3. -> Bring 1x [JP]Content Sketch 1, 1x [JP]Content Sketch 2, 1x [JP]Content Sketch 3. Full name is too long. Items 3.1 – 3.4 are done. Item 4 is also done. This item is sold under Equip – Head in MyShop. Note: The gacha images are incorrect at the moment but the contents are correct. We will fix the images at another time. Note: More may be added later. Remember those pamphlets that you got from Developer H in July? Well, you can exchange them for cool items with GM_Wan at Event Garden. 0. Edited: Magician Sephira resides in the lower left corner of Megalopolis. She is by Southwest Portal. Sorry for the confusion! 1. Edited: Creamed Rabbit appears during day time and Moving Chocolate appears at night. Both appear only in Southeast Forest, Southwest Forest, and Northwest Forest. 2. Each char can do this event up to 7 days only (1 cycle per day). Char will get the rewards in the order of the cycle. So for example, if you did Cycle 1 on Monday, you will get Cycle 1 reward on Monday. Then, let’s say you missed doing the event on Tuesday, but you did the event again on Wednesday. So on Wednesday, this is considered your Cycle 2 (day 2), and you will get the reward for Cycle 2 (day 2) on Wednesday. So you do not have to do the event every day, but you can do it totalling 7 days per char within this maintenance period. 3. The minimum level for chars to do this event is Level 30. This is a forum event. It is automatically closed on 23:59 on September 30, 2017. 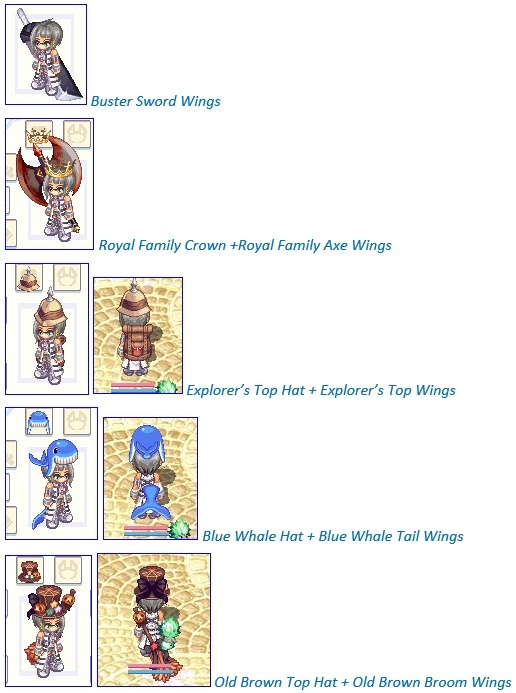 Please show us your beautiful self with the wings we have been publishing in the game. Be creative, be fun, be beautiful in your presentation. To all the September babies, happy birthday and may you be loved, happy, and blessed always. Please put up your suggestions in this thread for next month’s consideration. We do not promise to take up all suggestions but we will try to take up the ones that we could do and that add value to the game and the server. Have fun, be good, play fair and nice. ~ GMWan & the Playtrickster Team. Contents of above boxes can still be 2~3 slots. Prince Tutankhamen Boxes, however, give all 3 slot items apart from Pet (dunno if this was the same before patch). The [JP]Megaro cardboard hat made me laugh. Increase drop rate of love crystal ( captain skull 1st trial ) too hard to get. I would like to direct your attention to this please. This needs to be forever Turkey Stone. It's just a sign. It's too perfect to change. Maybe we should even change Turquoise in-game into Turkey Stones. I think Turkey Stone sounds cool though. Next, we can have Canada Stone. Edited by Aran, 24 September 2017 - 08:40 PM. Thanks so much for the Reindeer horn, Can't wait to get it! Is it possible to give some recycling value for items from the 4th anniv GB? or confirm if not? so i can just dump them. Can confirm, no value will be given. Only MyShop items are supposed to have Recycling Value. These are in-game Event Box items. Thank you for taking my suggestions on this patch! Also, can we have Le sitar box next maintenance? Mirage fild 5 - Alteo City. Note: When we press "D" and click it does not start to drill by itself. Nice patch. Thanks for this! Also, I didn't play rTO back in July, so I missed out on these pamphlets, are they still obtainable or was it just something from back then that I missed out on? Why can't I find Sephira in Mega? Am I lost?